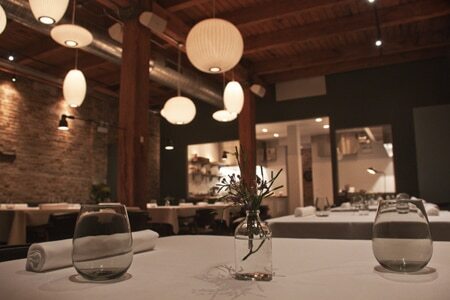 A duo of chefs strike off on their own with an elaborate tasting menu in the West Loop. : A 15-course tasting menu in a forgotten West Loop corner affords Noah Sandoval, formerly of Senza, the freedom to find his culinary voice. The menu at this intimate 28-seat restaurant varies dramatically, with each course flowing effortlessly into the next. A lone piece of buttery, briny uni served nigiri style and topped with crunchy toasted brown rice competes with that offered at any sushi restaurant. A yeasty capellini pasta flavored with black truffle puts many Italian eateries to shame. Midwestern flavors, like ramps with lamb belly, are strategic accents without the tired locavore label. The standard drink pairing incorporates saké, beer and mixed drinks with a reserve wine pairing available as well. Four dessert courses by Genie Kwon (Boka) conclude the evening, with the most memorable being a creative cheese course combining raclette, gianduja and black currant sorbet all queued across pretzel lavash. Service is relaxed and technically sharp without being intimidating --- a rare feat for a restaurant serving food of this caliber.